Victims of Midwest flood need your help! 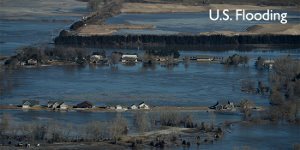 Give to the ELCA’s Lutheran Disaster Response to help victims of the historic Midwest flood. Historic flooding in the Midwest has led to at least three deaths and damaged hundreds of homes, and more flooding is expected as snow melts this spring. Your gifts will help address the unmet needs of those affected by the flooding, and together we stand ready to provide assistance recovery efforts. You can donate online through the Evangelical Lutheran Church in America. The church’s international ministry, Lutheran Disaster Response, already is working with local relief organizations. Gifts designated for “U.S. Flooding” will be used in full — 100 percent — to assist those directly impacted.